Ben Walden has played a number of leading roles on television and for the Donmar and Almeida theatre companies as well as at Shakespeare's Globe. 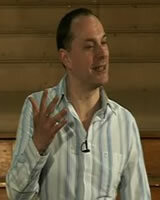 Having run many masterclasses for the Shakespeare's Globe Education Centre he has worked in close collaboration with Mark Rylance and Richard Olivier in the development of an experiential theatre learning technique called Mythodrama. As an Senior Associate at Olivier Mythodrama, Ben is now running sessions bringing this work at Leadership level into a broad range of organisations across the world. He has also run projects at a number of leading business schools including Columbia, OSBS, the London Business School and Insead. Ben’s work with Contender Charlie has received major acclaim at Heads and Deputies Conferences across the country. Raised in a California beach town to a Japanese mother and Jewish-American father, Phil first fell in love with spoken word poetry at age 17. Since then he has had the privilege of touring around the globe as a celebrated performer, writer, and teacher. He has appeared on NPR, performed at Lincoln Center, and most recently coached and performed on the 2011 Providence National Poetry Team, ranked third in the nation. His first book, A Light Bulb Symphony, was published in 2011, and his work can be found regularly in CHAOS Magazine. As the full-time co-director of Project VOICE along with Sarah Kay, Phil travels to colleges and high schools to perform his work and teach poetry workshops. Jeremy Gilley is an actor turned filmmaker, who in the late 1990s became preoccupied with questions about the fundamental nature of humanity and the issue of peace. He decided to explore these through the medium of film, and specifically, to create a documentary following his campaign to establish an annual day of ceasefire and non-violence. In 1999, Jeremy founded Peace One Day, a non-profit organisation, and in 2001 Peace One Day’s efforts were rewarded when the member states of the United Nations unanimously adopted the first ever annual day of global ceasefire and non-violence on 21 September – Peace Day. Peace One Day’s objective is to institutionalise Peace Day 21 September, making it a day that is self-sustaining, an annual day of global unity, a day of intercultural cooperation on a scale that humanity has never known. IGGY is a global online community, a social network designed to help gifted young people realise their full potential. It gives members access to great educational resources and encourages them to work with top academics and other gifted young people around the world. IGGY was created by the University of Warwick. Warwick has had a long history of encouraging bright students. It started with NAGTY, a government funded initiative to create resources and events for able students. When government funding stopped, the University decided that continuing to invest in the brightest minds across the world was probably a good idea. The rather catchier sounding IGGY was born. IGGY members can create their own profiles, make friends and collaborate with other gifted students around the world. They have access to great resources and top academics. They’re helping create a great site for gifted young people to exchange ideas, debate, learn and explore in a safe environment. During the conference all delegates will have complimentary access to the IGGY network. There will be a range of IGGY activities for delegates to try out some of the IGGY resources and apply their learning and discoveries from the conference.